I love the earthy flavour and meatiness of the mushrooms. Does anyone not like mushrooms on toast? It is such a simple dish, but the depth of the flavour is just beyond imagination. Mushrooms are also a nutrition power house. They are low in calories, fat-free, cholesterol-free, gluten-free, low-sodium – safe for everyone! They are rich in B vitamins, important for energy and the nervous system. Minerals rich in mushrooms are selenium, copper, potassium, iron, niacin, riboflavin and more. So it is great for weight management, anti-aging, controlling blood pressure and cholesterol, and strong immune system. Put all ingredients except cauliflower in a pan, bring it up to a boil, simmer for 15-20 minutes on low heat until cooked. In the meantime, grate cauliflower to make a cauliflower rice. 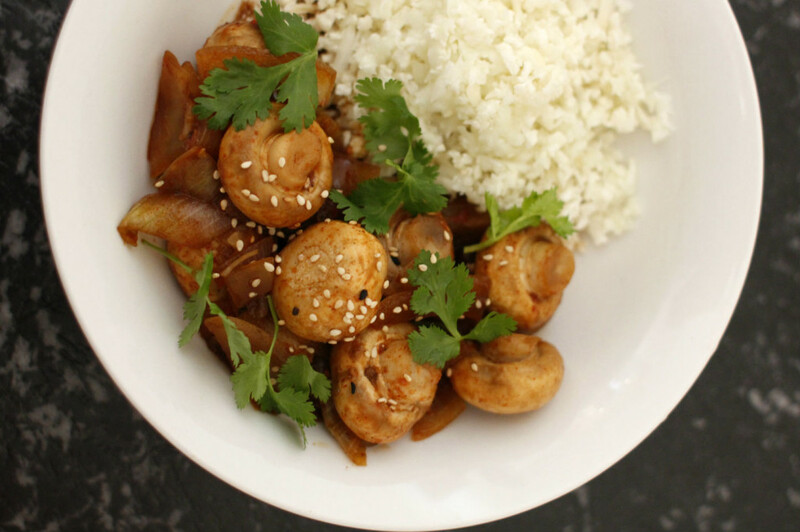 To serve, put braised mushrooms on the prepared cauliflower rice in a bowl and garnish with coriander leaves.